Showing 45 articles from August 13, 2014. LOUISBURG — The county’s first chance to figure out how to turn a golf course into a county park came and went Tuesday night with no activity. Last week, Franklin County commissioners agreed to offer First Citizens Bank $700,000 to purchase Bull Creek Golf and Country Club. LOUISBURG — The Franklin County Board of Education spent about $118,000 on new computer software, accepted the resignations of 25 teachers and filled three principal positions during a very routing Monday night meeting. The three principals hired included naming Monica D. Headen as principal of Long Mill Elementary, promoting her from the assistant principal’s position. 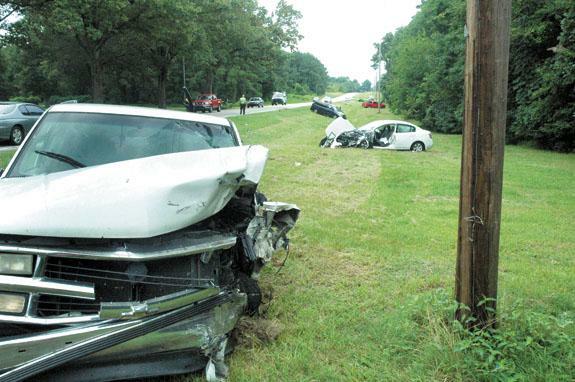 LOUISBURG — Authorities are looking for a Youngsville man they allege caused a three-car wreck. 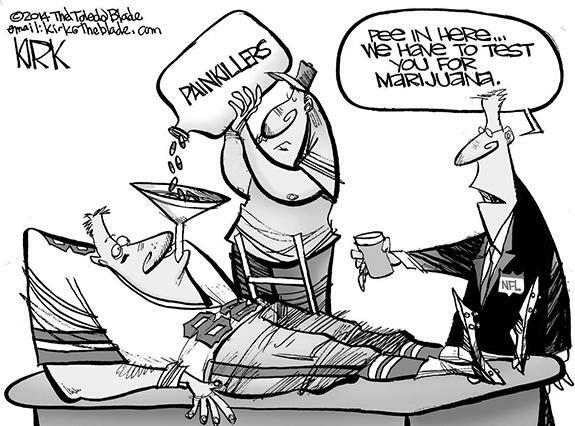 According to a report by Trooper D.J. Ball, Dan Giles, 44, was driving a truck north on U.S. 401 when he apparently began to cross the center line at about 10 a.m. on Aug. 11. He sideswiped a van driven by Karen Harley of Hollister before running head-on into a Nissan Sentra driven by Elizabeth Worsham of Mooresville. LOUISBURG — A former employee continued to assail the county’s airport director over management issues, but pilots and tenants defended leadership at Triangle North Executive Airport. And they fingered former operations specialist Bruce Allen as being disruptive and creating a hostile work environment. 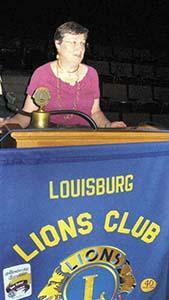 History has been made at the Louisburg Lions Club as Joy Watkins has become the first female president of the club. 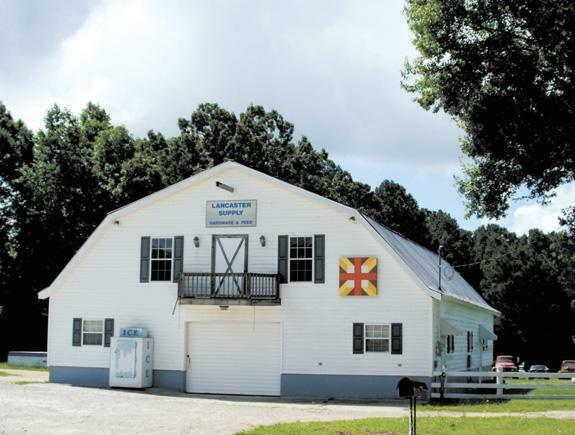 The Louisburg Lions Club was chartered in 1942 and currently has 31 members and the club’s first lady president. The club’s new president is a Louisburg native and a graduate of Meredith College. She also comes by her service to the Lions Club naturally. How’s this for a new Franklin County motto? That pretty much sums up the four and a half year search for a park that apparently has been settled — but with a solution that raises more questions than it provides answers. If a new machine that was announced recently catches on in the real world, it’s going to send parents from coast to coast looking for a new threat to use on their children! For a generation — and maybe two — parents have been threatening their kids with either buckling down in school and getting a good education or facing a life of “flipping burgers” in a fast foot restaurant. It’s a topic not many people want to talk about. But, if something can be done about it, it needs to see the light of day. It was about 11 years ago when I wrote a story for this very newspaper about suicide, prompted by two suicides committed within days of each other. 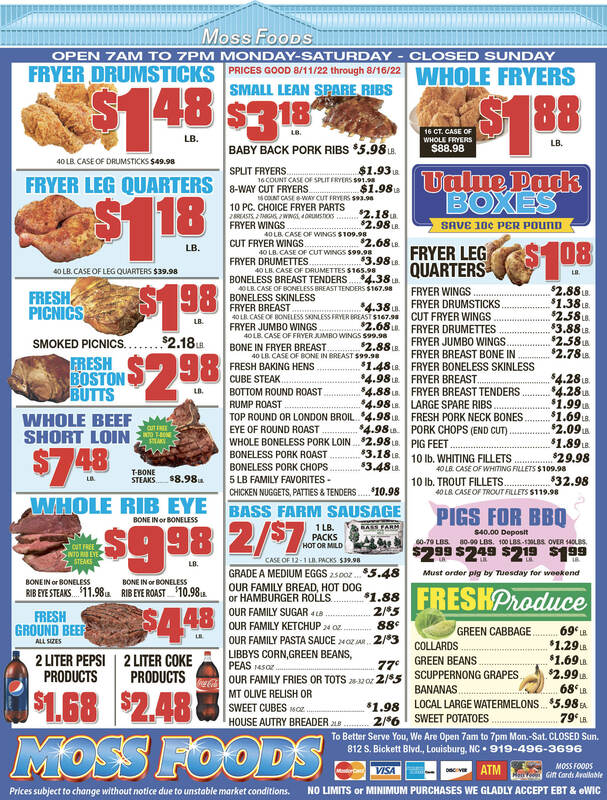 If you can’t dazzle them with brilliance – well you know the rest, and this is a family newspaper. That is exactly what the radical Republicans in Raleigh attempted to do this summer. The summer was spent mainly tweaking a budget that not only didn’t serve the needs of North Carolina residents, but was running a huge deficit. Steve Merritt states there has been a 45 percent increase in aircraft population at Triangle North Executive Airport. If Merritt’s statement is correct, I would like to know how much of this increase was attributable to his actions and how much was attributable to other factors beyond his control. UP IN THE AIR. 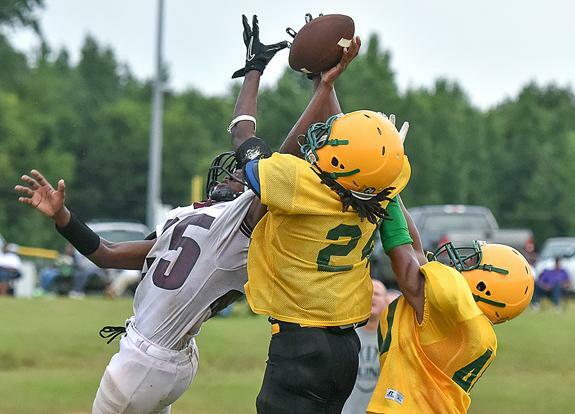 Bunn High School’s T.J. Jones (left) deflects a pass attempt during Tuesday night’s football scrimmage on the road against Nash Central at The Dawg Pound in Rocky Mount. 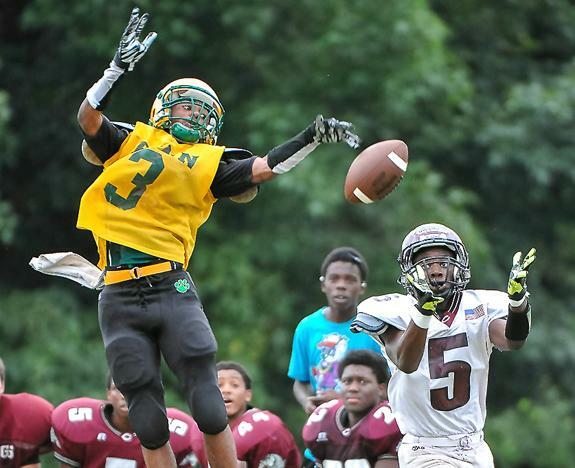 ROCKY MOUNT -- Circumstance and setting don’t seem to matter when Bunn and Nash Central square off on the football field. Even during preseason scrimmages, intensity is evident between the squads -- as evidenced by Tuesday’s meeting at the NCHS Practice Field. LOOK OUT BELOW. 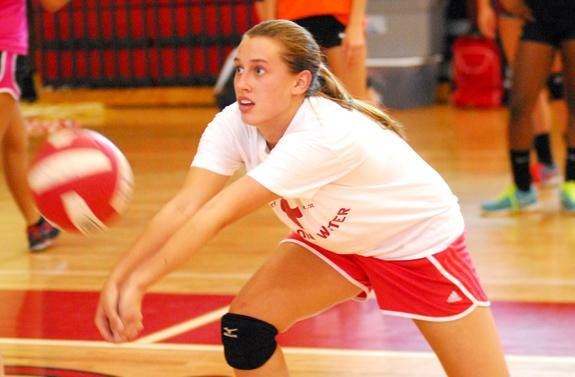 Bunn’s Amanda Dean works on her defense during a recent volleyball practice. BUNN -- It’s a story that seems to repeat itself every fall for the Bunn High School volleyball squad. Each year, the Ladycats suffer heavy graduation losses, leaving observers to wonder if BHS can keep its long streak of spike success going. And every time, Coach Henry Jones and his Ladycats seem to have an answer. LEADING THE CHARGE. 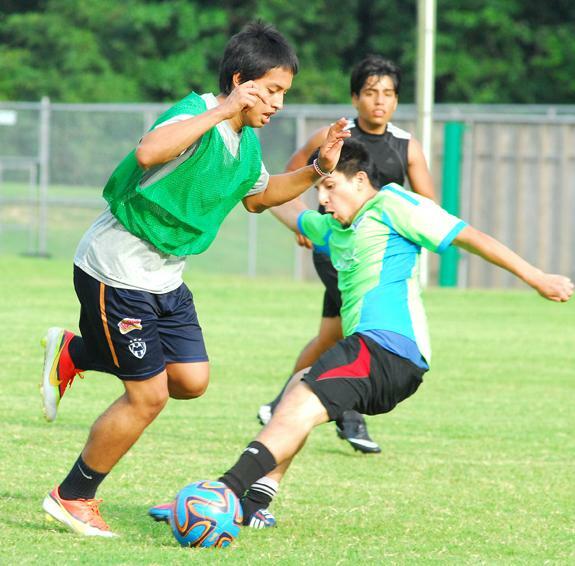 Bunn High School’s Arturo Carbajal (left) speeds upfield during a recent Wildcats’ intrasquad boys soccer scrimmage. BUNN -- Charles Haley didn’t have much time in 2013 to prepare for his duties as the boys soccer coach at Bunn High School. About one week, as a matter of fact. Certainly, there wasn’t any transition time for Haley to become acclimated to his players -- and vice versa. SPIVEY SOARS. 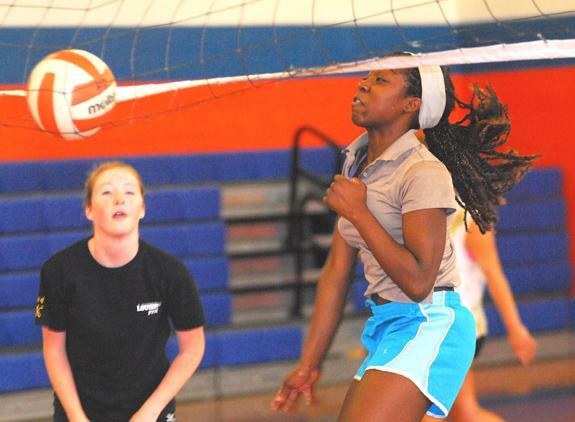 Louisburg High School’s Phoenix Spivey (right) works at the net during a recent Lady Warriors’ volleyball practice session. LOUISBURG -- After being dominated by freshmen last season, it was almost unthinkable that the Louisburg High School volleyball squad could be just as young in 2014. 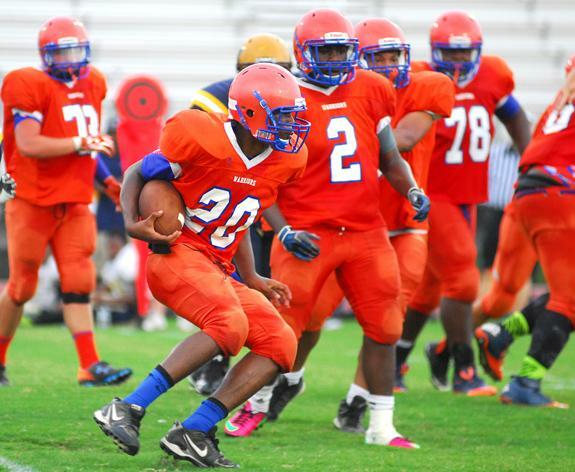 But LHS will have yet another ninth-grader available to step into the lineup immediately. She’s Whitney Bolton, who is expected to start at middle hitter for the Lady Warriors. LOOKING TO PASS. 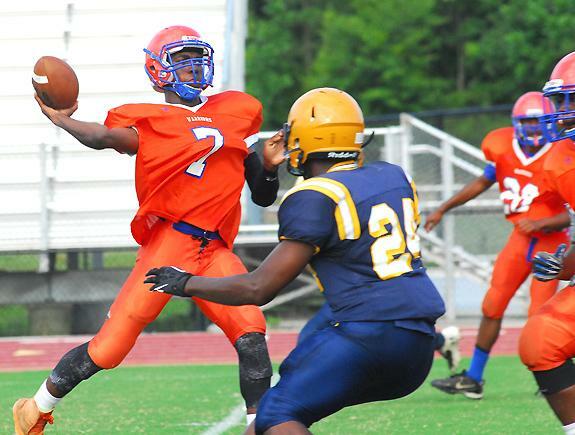 Louisburg High School’s Malik Sidibeh (left) delivers a pass attempt during Tuesday evening’s road football scrimmage at Rocky Mount. ROCKY MOUNT -- Round One of Louisburg High School’s football scrimmage work featured a homecoming on Tuesday for veteran LHS skipper Chris Lee. Lee took his Warriors for yet another preseason to Rocky Mount High School -- where the coach served as an assistant before heading to Louisburg. ZEBULON -- Cole Sulser tossed six solid innings on Sunday afternoon for the Carolina Mudcats, but it wasn’t enough as the Myrtle Beach Pelicans came away with a 5-1 win at Five County Stadium in Class A Carolina League baseball action. The Pelicans (29-21, 73-45) swept the series. The Mudcats (23-26, 52-64) lost their eighth straight at home. 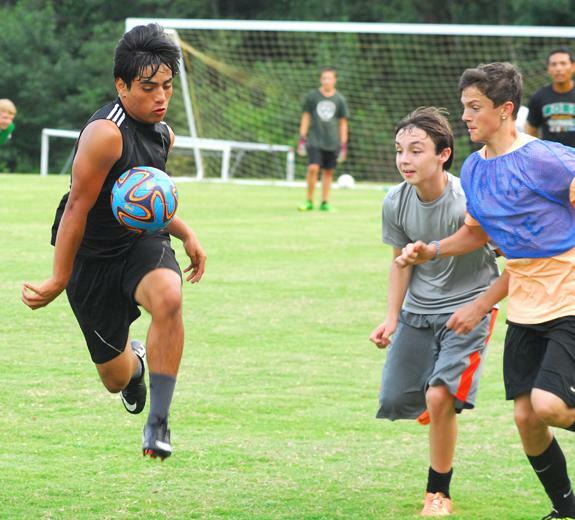 FRANKLINTON -- Franklinton High School will take part in the 2014 Lane and Wade Boys Soccer Jamboree this Saturday at the Capital Area Soccer League Fields on Perry Creek Road in Raleigh. The event is staged in honor of Wake Forest High School’s Lane Meyer and Franklinton’s Wade Halford. 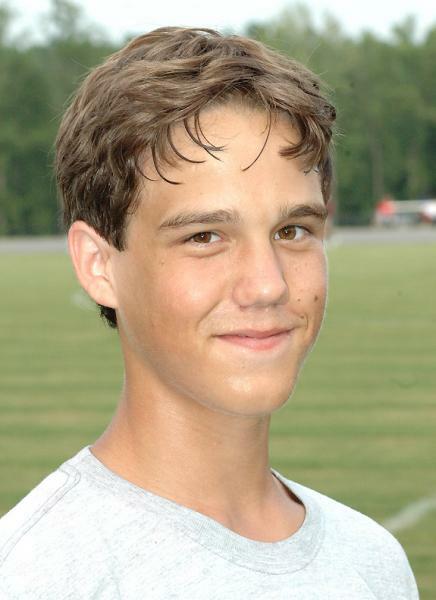 Both former soccer standouts at their respective schools were killed in tragic auto accidents in 2011. FRANKLINTON -- The successful Louisburg College women’s basketball program has landed a pair of Franklin County recruits. LC head coach Shay Hayes announced recently that Franklinton’s Diesha Davis and Alexus Coles will join the Lady Hurricanes. Hayes indicated that both Davis and Coles will begin their LC careers on the junior varsity level. MIKAELA MAKES HER MARK. 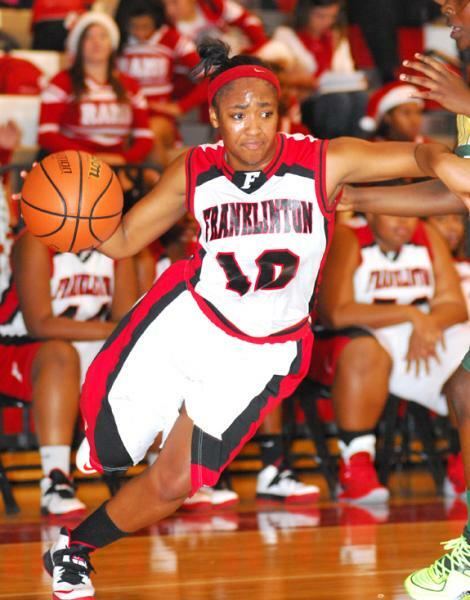 Mikaela Pulley will be a key rotation player this fall for the Franklinton Lady Rams. FRANKLINTON -- Few are the coaches who bring just as much -- if not more -- enthusiasm to practice sessions as their players. It’s just not supposed to work that way. But Franklinton’s Crystal Barnes is able to pull off that feat -- practice after practice. ZEBULON -- A strong week at the plate for outfielder Logan Vick was recognized by the Carolina League on Monday. The league announced the Kerrville, Texas, native won the Hitter of the Week award for August 4-10. This is the first such honor for Vick and the second for a Mudcats’ hitter this season. Vick, 23, hit .381 (8-19) in five games this week for the Mudcats. Four of those hits were doubles and another was his third home run of the season. LOUISBURG -- Louisburg College took a quick step to fill a pair of unexpected summer coaching openings. In the span of one week, LC Athletic Director Mike Holloman found new coaches for both the men’s soccer and women’s softball programs. LC’s long-time successful men’s soccer squad will be led by Martin Dell, who joins the Hurricanes from Richmond, Va.
THAT’S STRETCHING IT. Franklinton’s John Fraser (left) works out the kinks before Monday’s practice session. 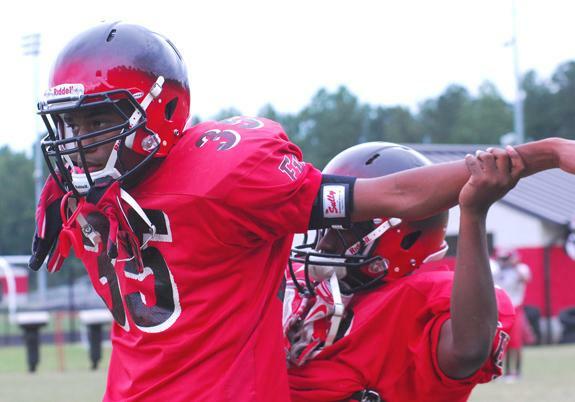 FRANKLINTON -- With turnover at several key positions, Franklinton High School’s football team is still in the process of working out some kinks ahead of next Friday’s regular season opener on the road at Goldsboro. 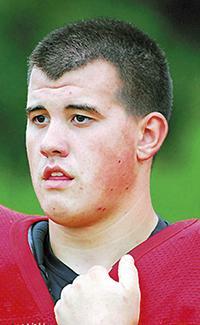 The Red Rams have won 17 contests over the past two campaigns, and made the Class 2-AA State Playoffs in each year. But Franklinton still had some questions moving into an important 48-hour stretch that will feature scrimmage work at Heritage High School (Wednesday). 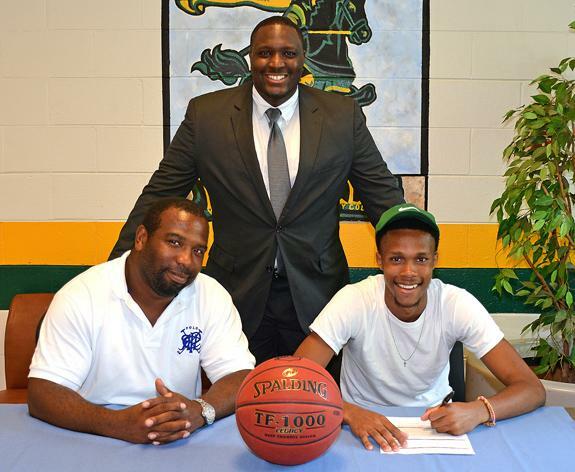 Reatt Marquis Foster of Hartsville, S.C., recently signed a letter-of-intent to join the men’s basketball team at Vance-Granville Community College next season. Foster is pictured above (right), signing his letter with his uncle, Anthony Merchant, at left. Standing in back is Matthew Johnson, assistant coach for the VGCC Vanguards. Foster (6’1”) is a graduate of Hartsville High School and was a guard on the team that won the South Carolina 3A state title in 2013. 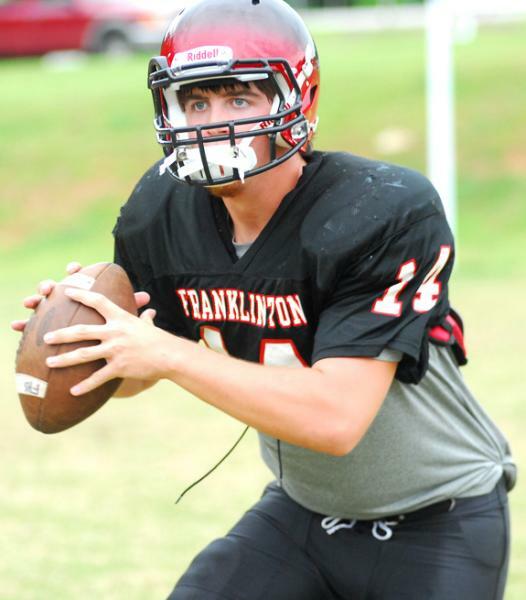 Avery Wilder is one of three performers being considered for the starting quarterback position for the Franklinton Red Rams. Louisburg High School’s Octavius Scoggins (with ball) follows his blockers en route to a substantial gain during the Warriors’ football scrimmage on Tuesday evening against Northern Vance and homestanding Rocky Mount in Nash County. Bunn’s Rey Murillo (left) advances the ball into scoring position during last Friday evening’s boys soccer intrasquad scrimmage at the BHS Soccer Complex. Franklinton High School’s Diesha Davis will continue her basketball career this season as a member of the Louisburg College Lady Hurricanes under Coach Shay Hayes. 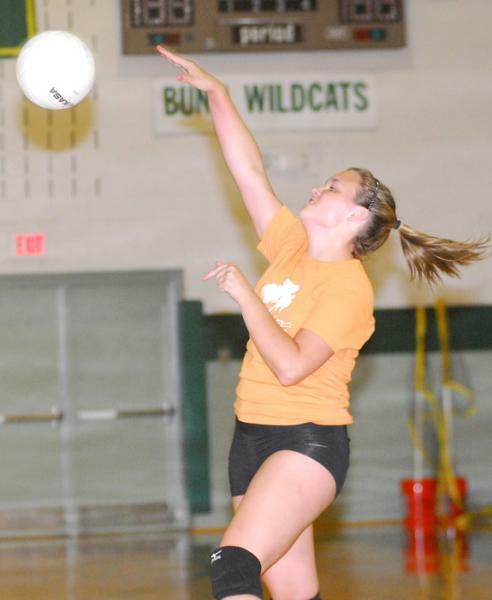 Bunn HS senior Kristy Green goes up for a kill during a recent practice session for the Ladycats’ volleyball squad the Bunn Dome. Bunn’s Tevin Perry (center) comes down with the ball in tight quarters during Tuesday’s road football scrimmage at Nash Central. 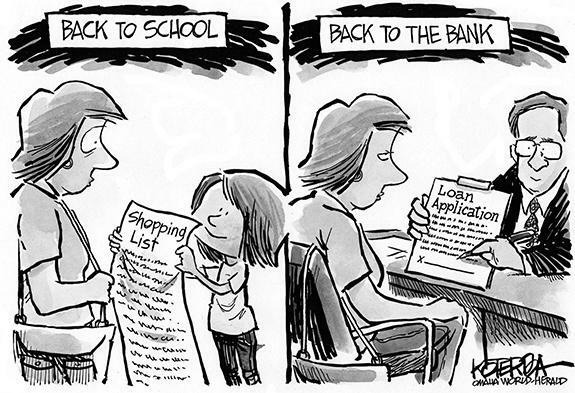 It’s back to school time; are your children ready? The advertisements are rolling in, everything is on sale, and it is time to think about our children going back to school. The question is: What do we want, what do we need, and what are things we can do now to prepare for the transition from summer to school, and beyond? 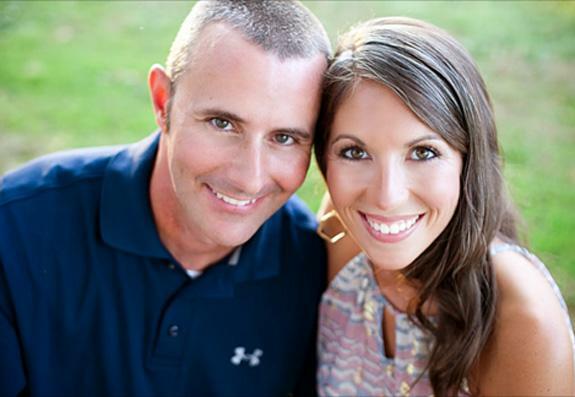 Beth Kinal of Zebulon and Tom and Debi Kinal of Avon Lake, Ohio, announce the engagement of their daughter, Natalie Renee Kinal, to Jeffery Lynn Pearce, the son of Lynda Pearce of Rolesville and the late Douglas Pearce. An Oct. 18 wedding is planned at Poplar Spring Baptist Church, Zebulon. H.W. and Jean Chappell of Franklinton celebrated their 60th Wedding Anniversary at the Angus Barn on Aug. 13. 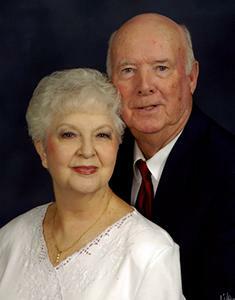 The couple has two sons, Mike Chappell and wife, Linda and Terry Chappell and wife, Cathy. They also have two granddaughters, Brittany Farner and husband, John and Andrea Chappell. They were married Aug. 13, 1954. WET N WILD. 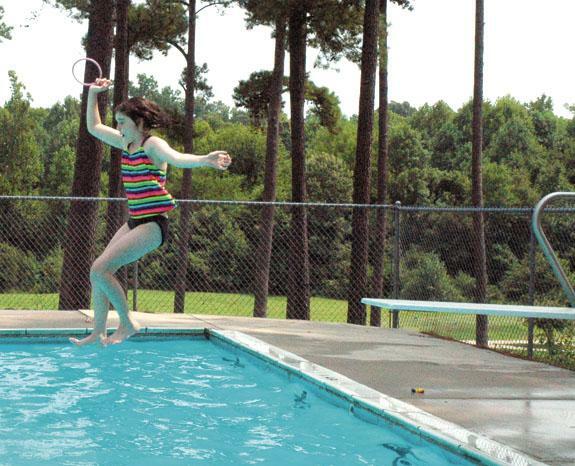 Above, Kitt Story captures a ring after jumping off the diving board at Green Hill Country Club. She was one of about 50 kids through the local Happy Camper group who got a week of camp activities with the Kerr Family YMCA, which brought their camp to Louisburg College and Green Hill last week. Sheriff’s deputies made two drug arrests, either at or near two convenience stores. First, during the early morning hours of Aug. 7, Dep. Brandon Strickland was performing a business check at County Line Grocery and Grill in the 2900 block of Pilot-Riley Road when he noticed a truck with an air-conditioning unit and moped in the back. WHAT’S THE MEANING? Of this block at Lancaster Supply in Centerville? Hint, the block is called Gold Brick. It’s a tip of the hat to the Centerville area’s gold mining heritage. With 20 blocks already in place and another 10 contracted and in process, Quilt Trails of the Tar River team leader and Franklin County Arts Council board member, Charles Powell, reported at last week’s FCAC quilt team meeting that the word is getting around about the quilt trail. “Two or three carloads of people come by every week to ask about the quilt trail. Last week there were 10,” he said. 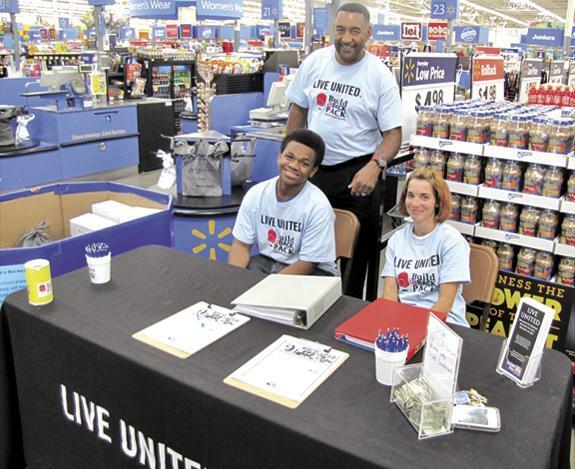 Volunteers Aaron Snowell, standing; Jamie Ayscue, right, and Jonas Williams volunteer recently for the United Way of Franklin County Build-A-Backpack event in Louisburg. Collections of backpacks and school supplies as well as monetary donations will be accepted through Aug. 22. Community groups and businesses are being encouraged to bring in donations, especially pencils, pens and notebook paper (college or wide ruled). Women, Infants, and Children (WIC) is a federally funded, supplemental food program which provides nutritional foods to help babies and young children improve their developmental growth. The main goals of the WIC program are to improve the nutritional status of eligible women, infants, and children from low to moderate income families by providing healthy foods, nutritional education, and access to other social and health programs. RALEIGH — More than 90 percent of motorists in the state wear seat belts — accounting for highest rate in state history. However, out of the test area, Franklin County brings up the rear with 86.5 percent of its vehicle occupants buckling up. Enforcement and education, said Cpl. J. Kimball, a Youngsville officer and area coordinator for the Governor’s Highway Safety Program, will be the tools used to bring those numbers up. Would sale lessen water rates? LOUISBURG — Franklin County commissioners agreed to send Franklinton a proposal to buy their water system. Franklinton commissioners are expected to discuss the proposal this coming Tuesday. 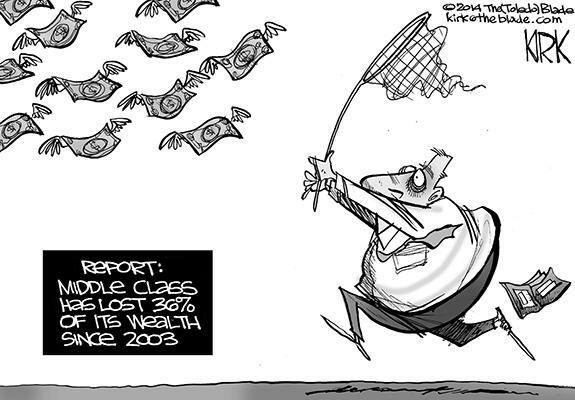 The offer would cover the town’s debt on the system and lower customer rates by 42 percent. Commissioner Shane Mitchell made the motion to proceed. The unanimous decision was made last week. Dr. Bert Kelling, far right, celebrated 35 years in business this week during a celebration for his clients on Monday. In the photo, from left to right, are Leslie Mata-Ruiz, Tracy Gaddy, Danielle Phillips, Catherine Lewis and Debbie Dearstine. 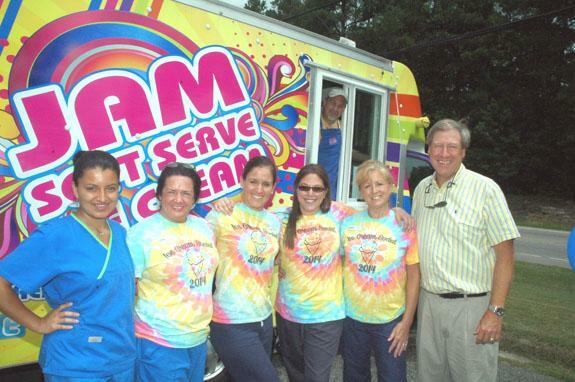 In the back is Artie Blume of Jam Ice Cream, which catered the event. Dr. Bert Kellin Orthodontics is located at 1007 N. Bickett Boulevard in Louisburg.